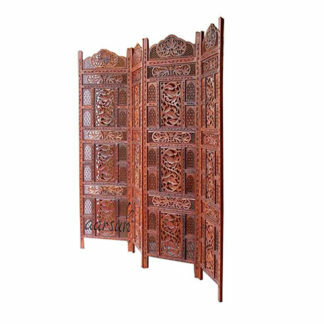 Aarsun Woods brings you Handmade Wooden Partition Screen / Room Divider in Traditional Kashmiri Design. The Partition consists of four Screens / Panels each handcrafted by skilled artisans. 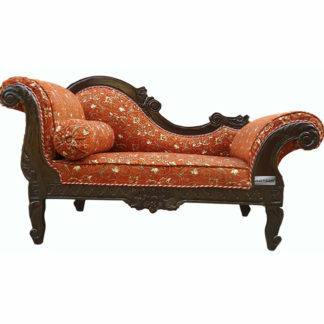 The Partition is made from Seasoned Mango Wood & MDF with fine traditional carving adding a touch of elegance to the room placed. This stylish partition separates the living room area from the rest of the house or can be used for separating Puja Space from the rest of the house. The carving is not limited to the inner portions but extends to the Main Frame thereby adding a rich look to the Wooden Room Divider. Each partition screens made by Aarsun Woods have a standard size of 72 inches (6 feet approx.) and 20″ fromt width for each panel. The Partition is meant to be placed in Zig Zag Position and is foldable and portable. Most room dividers may be wiped clean with a wet cloth and you can perform the maintenance when you clean the room. Stylish solution for use in multiple areas: close off areas to reduce noise / divide space. The material and colour you choose for sliding doors and room dividers will depend on your needs. Allow your imagination to wander and consider your options before simply deciding on a material and colour.